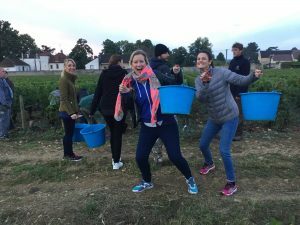 Vendanges at Château de Pommard starts tomorrow. We can’t wait and hopefully you’ll be here to share it with us. To celebrate this awesome occasion, here is our third part of our Harvest Through History series, concluding with Today! 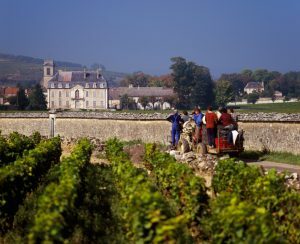 Enjoy the view from the present day and enjoy a clos encounter of the first kind with Harvest time at Château de Pommard. To take a look at Part Two of Harvest Through History click Yesterday and for Part One, click Yesteryear. 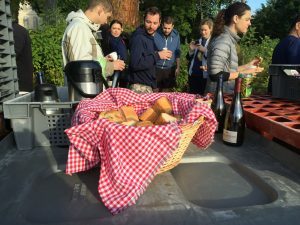 To reserve your place on our your Harvest Experience, click Yes Please! Emmanuel offers his years of experience to the volunteers who have come to enjoy their Harvest Experience. The time is just after sunrise! 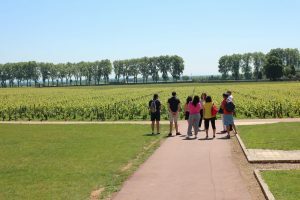 Our expert wine advisor, Julie, walks-and-talks a small group of guests in Clos Marey-Monge before a Harvest Experience. 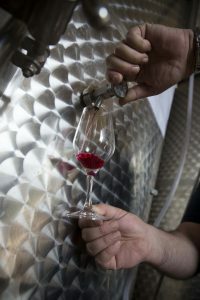 Emmanuel, our winemaker, and Charlotte, a member of our team, pour and serve juice fresh from the fermentation tanks to guests on our Harvest Experience. At this stage, the juice is very sweet and bright light red. Our vineyard team clean and prepare the machine a few weeks in advance of the start of Harvest. 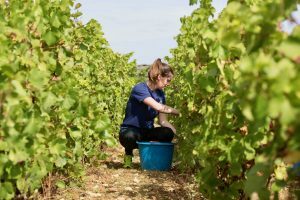 Rachel and Charlotte, two of our most enthusiast grape pickers from Vendanges 2016, are ready to hand-pick grapes. They’re coming back for 2017, of course. Cameron, one of our Harvesters in 2016, shows off what she learnt during her Harvest Experience. Charlotte, an experienced grape picker, shows us how hand-picking grapes is meant to be done! Lunch is served! 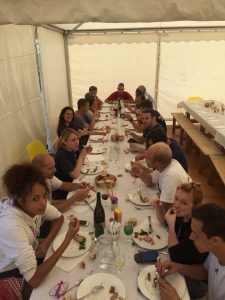 Harvesters take a well-deserved break and enjoy a spot of lunch (with wine, naturally!) in a large tent in the vineyard. Refreshments for all our volunteers are, of course, served throughout the day. 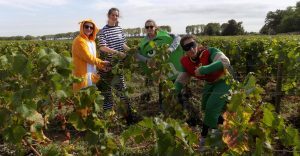 Some volunteers ensure they squeeze every drop of fun from their Harvest Experience and select a stunning array of fancy dress costumes. 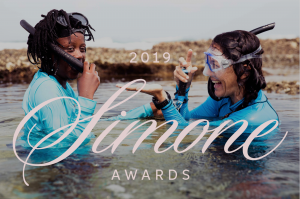 In recent years it has become a Pommard tradition – and one of which we’re very proud! 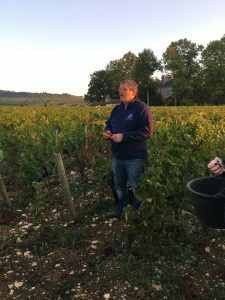 Emmanuel talks us through his preparations and what happens during Harvest time, while standing in Clos Marey-Monge’s Micault plot. 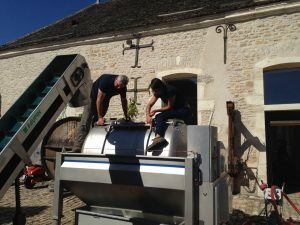 The Cuverie team sort the grapes on the gently vibrating Sorting Table. 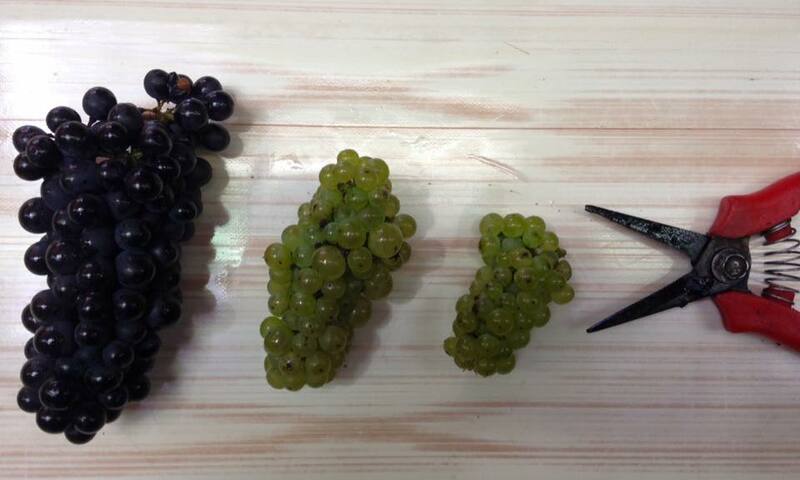 To sort grapes, you need to taste them! 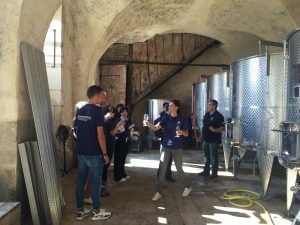 Emmanuel shows guests on a Harvest Experience the ins and outs of a fermentation tank, where the grapes are placed immediately after being sorted. 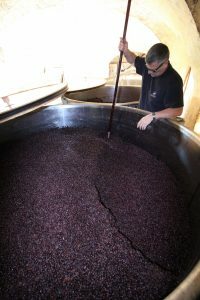 The Cuverie team pump up juice from the base of the fermentation tank and spray it over the grapes at the top of the tank, a process known as Pumping Over. 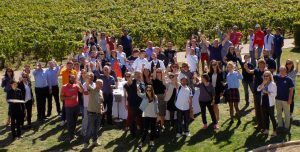 At the end of the Vendanges, our volunteers and team like to party and celebrate hard work done well. 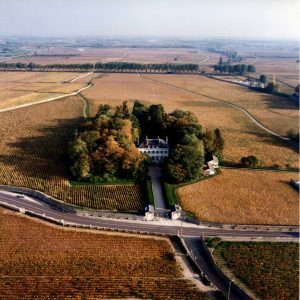 It’s a great opportunity to raise a glass and shout “Salut” to Clos Marey-Monge for all of her hard work. With Harvest gone, the once lusciously green vineyard quickly starts to transform to a soft golden hue. Just when you thought Nature is finished for the year, she gives you even more beauty to stare at. 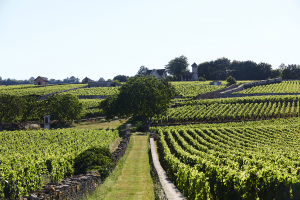 For those of you who enjoy a good sunrise, there’s nowhere better on earth than watching it in Clos Marey-Monge.